When Edward N. Washburn III slipped on his gray herringbone fedora, grabbed his keys, and offered to show me his community, I couldn’t resist. We were, after all, in the blink-and-you-miss-it Rutherford County neighborhood of Washburn, named after a long line of his ancestors whose entrepreneurial endeavors turned the crossroads into a district that was added to the National Register of Historic Places in 2002. 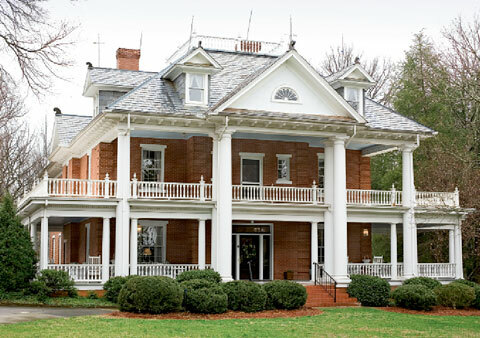 Even though I’m here to see the stately Southern Colonial he and his wife, Catherine, call home, I jump at the chance. So with Edward at the wheel, we drive down Bostic-Sunshine Highway. He points out the family barn, built in 1915, which the couple restored last year. We pass the houses where the Washburns’ children and grandchildren live. Then we make a stop at the family business, Washburn General Store. The shop dates back to 1836, when one of Edward’s ancestors, Benjamin Washburn, received a one-year license to sell small amounts of liquor at the stagecoach stopover. The two married in 1899. A cotton broker who owned three stores and helped start Bostic Bank, Nollie finished the house, complete with 14 rooms, including seven bedrooms, nine fireplaces, and two great halls, nearly 15 years later for less than $10,000. In 1945, Edward moved there with his parents—his father was one of Nollie and Grace’s eight children—when he was about 15 years old. “My mother and daddy bought the house from the other children,” he says. He and Catherine met at Cool Springs High School and the two married in 1952, had three children, and went on to run the general store and take up residence in this show-stopper. These days, it isn’t unusual for high school students to stop by on their way to prom and pose for pictures in front of the home, Catherine says—a tradition started by one of the Washburns’ granddaughters. “It’s kind of grand for being out in the middle of nowhere,” she says with a laugh. Just through the front door, the first great hall, with its dark oak architectural molding outlining every wall and door, gives the home an immediate richness. Similar woodwork, all of it original, carries over into each room, from the built-in bookcases in the library to the impressive fireplaces. The parlor showcases the home’s most expensive and ornate mantel, which features scrolled columns on either side and an arched inset mirror over a surround of deep brown tiles. The couple still has the ledger where Nollie recorded how much he paid for every piece of lumber and brick he bought to construct the home. This mantel cost $42.50. The other eight were made for a total of $147.91. The Washburns have taken great care with antique furnishings that are cherished, not just for their style, but for the long ancestral ties they represent. “The pieces are things that belonged to all three generations,” Catherine explains. For instance, the couple still has Grace’s secretary, which sits in the library near large windows that offer views across the wide porch toward the crossroads and general store. The cabinet’s glass doors remain open, revealing a collection of books, photos of some of their nine grandchildren, and drawers where they keep Grace’s correspondences from 1930 that are still in their envelopes, affixed with 2-cent stamps. Those generations make regular pilgrimages home. The grandkids board horses in the barn and come by regularly for rides on the grounds. And the house is often the site for weddings and other family celebrations. The large formal dining room seats 15, but it still can’t hold all the Washburns. “When they come,” Catherine says, “it just overflows.” When they gather for their annual portrait, Edward points out, nearly every inch of the home’s brick steps are covered with children and adults. As Edward finishes up some business at the store and the daylight begins to fade, Catherine and I wander the halls. “Everything here is somebody’s,” she says of her home’s antiques. “I tried to keep things that were important.” And with this family tending their roots like a beloved garden, it’s likely the Washburn legacy won’t soon be forgotten.